People across B.C. 's South Coast woke up to fresh snowfall warnings, more school closures and treacherous conditions on many roads Tuesday morning. The snow that started falling around rush hour Monday continued all throughout the night in some areas, leaving compact snow on several busy commuter routes, including parts of Highway 1. 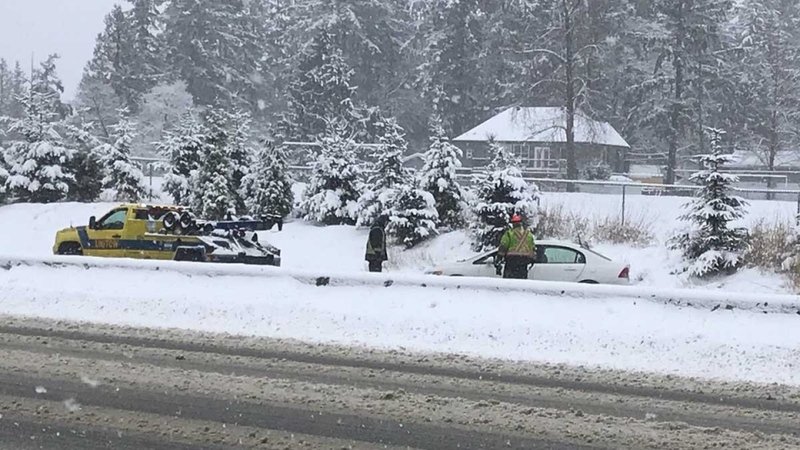 Not even snow plow drivers were safe from the slippery conditions – one plow lost control on Highway 1 in Burnaby, crashing into a concrete median at around 1:30 a.m. The snow triggered hundreds of new school closures, including every public elementary and secondary school in Vancouver, Surrey, Burnaby, Richmond, Delta, North Vancouver, West Vancouver and other cities across the region. A number of colleges and universities closed their campuses as well, including UBC, Capilano and Langara. Crews were busy all night salting, brining and plowing roads, but struggled to keep ahead of the weather. Environment Canada issued new snow warnings early Tuesday morning, forecasting some South Coast cities could see up to 25 centimetres of fresh snow over the course of the day. "A second low pressure centre in as many days is giving more snow to the South Coast today," the weather agency said. "Prepare for quickly changing and deteriorating travel conditions. Surfaces such as highways, roads, walkways and parking lots may become difficult to navigate due to accumulating snow." Vancouver, Burnaby, New Westminster, Coquitlam, Maple Ridge, West Vancouver, North Vancouver, Chilliwack, Hope and Abbotsford are expected to be the hardest hit, with anywhere from 15-25 cm of snow in the forecast. Environment Canada is predicting lesser amounts, from 10-15 cm, in Surrey, Langley, Richmond and Delta. Even commuters who left their cars at home faced some difficulties Tuesday, with TransLink reporting multiple service disruptions and delays due to snowy and icy roads. The transit provider said Expo and Millennium SkyTrain lines were both "running regularly but with a reduced frequency" throughout the morning because staff needed to watch for weather-related problems on the tracks. Some routes were delayed by up to 30 minutes, including the 10 Granville-Downtown. "Give yourself extra time for your commute and remember to dress warmly in anticipation of potential delays," TransLink urged riders on Twitter. Vancouver International Airport said crews were out in force dealing with snow on the runways, but several flights still had to be either delayed or cancelled Tuesday morning, including trips to Toronto, Edmonton, Portland and Las Vegas. The airport said travellers should check the status of their flight before leaving home and give themselves plenty of extra time to arrive. "Maintaining a safe and secure airfield for aircraft and passengers is the focus of everything we do at YVR. We appreciate the patience of all passengers as our crews work to get aircraft on their way as quickly and safely as possible," YVR said in a statement. This is a developing story. Check back for updates throughout the day. 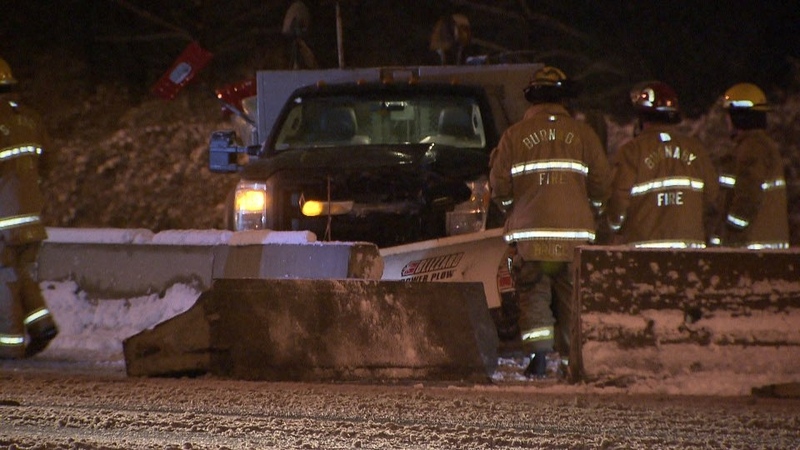 Crews respond to an early morning crash involving a snow plow on Highway 1 in Burnaby, B.C. on Feb. 12, 2019.